I have seen this situation a number of times. A large mailbox (or mailbox and archive) wont move to the target because the process of checking what the changes are in the mailbox take too long, the network or Exchange Server times out the users move and then reports the mailbox is locked. Search the report that you have saved in the above cmdlet and search for “Error” in the text file. If you get the following then the mailbox is probably too large for a successful move, which means the source server or network has not got the resources. What can happen is the move is progressing and a check happens for changes to the source mailbox – this takes a long time to complete and something times out. When target Exchange tries to connect again, the source has lost the TCP port and so a new move is started, but the mailbox is still locked for the old move. Therefore the move cannot continue. Message : Error: Couldn’t switch the mailbox into Sync Source mode. 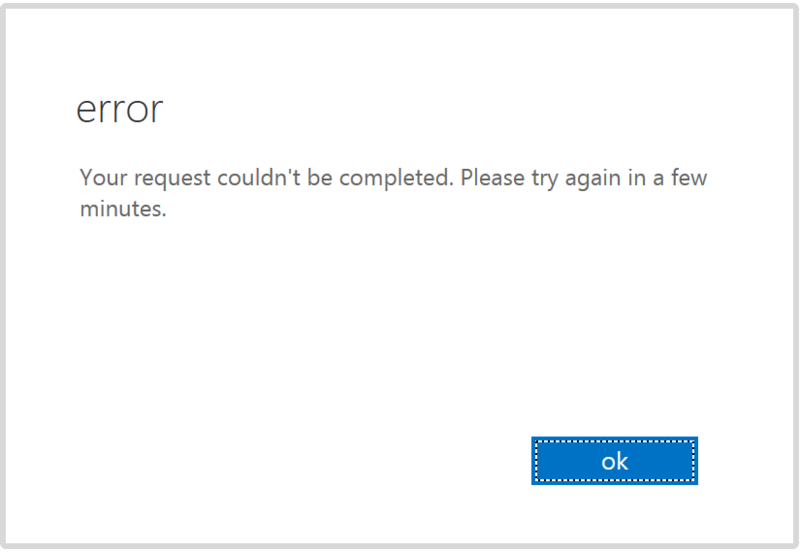 Network errors are preventing MRS from cleanly closing its session with the Mailbox server. If this is the case, MRS may continue to encounter this error for up to 2 hours – this duration is controlled by the TCP KeepAlive settings on the Mailbox server. InTransitStatus, PropertyErrorCode: AccessDenied, PropertyErrorDescription: . Of interest in the error is the point that says “MRS may continue to encounter this error for up to 2 hours ”. This time value matches the default TCP KeepAliveTime value. Raising this in the registry and restarting the MRS service (not the server) changes the lock timout, which means that when the long job that is happening on the target finishes (and takes longer than two hours), the source server is still waiting for the connection and does not throw the above error. Once you have your mailboxes moved, delete the registry value (to put it back to the default of two hours) and avoid rebooting the server when this key is set to a different value. 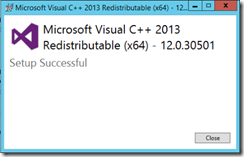 If you started with a different value return to that one instead of deleting the registry value. The KeepAliveTime setting is found at \HKEY_LOCAL_MACHINE\SYSTEM\CurrentControlSet\Services\Tcpip\Parameters, and its a DWORD value called KeepAliveTime. The value is in milliseconds, so 7200000 is two hours and 86400000 is 24 hours (which is the value I tend to use to resolve this issue). This change is made on the mailbox server and the service restarted on that server (or servers if you have more than one). ” was run: “Microsoft.Exchange.Configuration.Tasks.TaskException: Process execution failed with exit code 3.
in ExchangeSetup.log located in the <SystemDrive>:\ExchangeSetupLogs folder. In this error the file ExSMIME.dll fails to copy. You can find the correct copy of this file in the CU source files at …\CU22\setup\serverroles\common. I copy the ExSMIME.dll file from here directly into the \Program Files\Microsoft\Exchange Server\v15\bin folder and then restart the upgrade. I have found that the upgrade fails again here if it things there is a pending reboot due to other installations and I have also seen at this point the detection for the VC++ runtime fails. 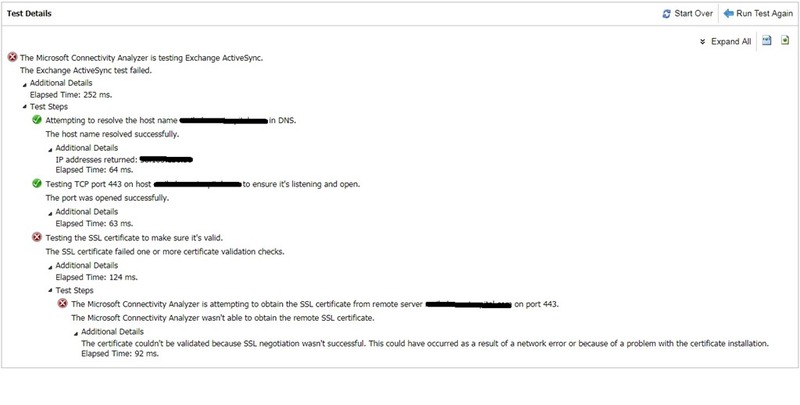 I have documented this elsewhere, and the workaround for the is found at https://c7solutions.com/2019/02/exchange-server-dependency-on-visual-c-failing-detection. A reboot later and the installation is successful. The error somehow seems to think that the file is not where it is looking for it. In the ExchangeSetup.log file it records the issue as “Error 3”, which generally means “not found”! This one is an interesting one – and it was only resolved by a call to Microsoft Support, who do not document that this setting is required. The scenario is that you upgrade your CRM Router to v9 (as this is required before you upgrade Dynamics to V9) and you enable TLS 1.2 on the router server as well (also documented as required as part of the upgrade). 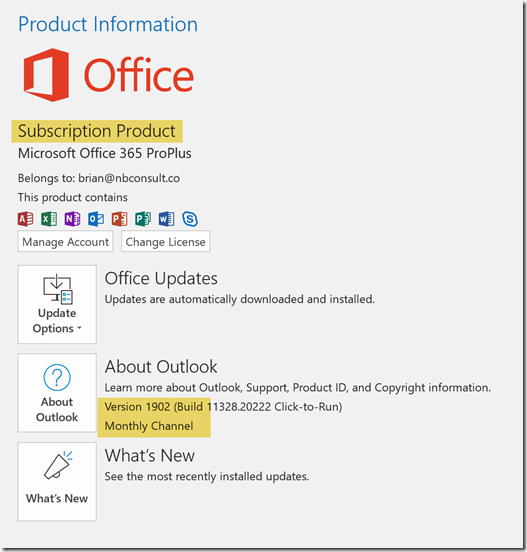 Dynamics is updated and all your email that is processed using the Router stops. Everything was working before and now it is not! The fix is simple though – and complex as well. The simple thing is that it is a a single check box you need to set. The complex thing is that as this is a GDPR setting, each user needs to do it themselves and it cannot be enabled in bulk! Once each user does this, the router will start to process emails for this user again. Exchange Server for rollup updates and cumulative updates at the time of writing (Feb 2019) has a dependency on Visual C++ 2012. 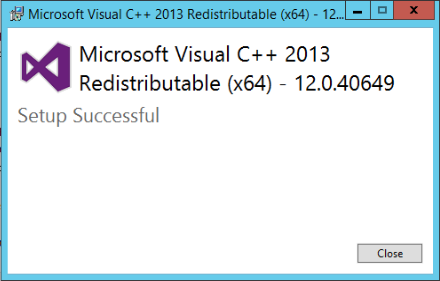 The link in the error message you get points you to the VC++ 2013 Redistributable though, and there is are later versions of this as well. I found that by installing all versions VC++ 2011, 2012 and 2014 I was able to get past the following error – which I had on only one out of many servers. om/download/details.aspx?id=30679 to download the binaries. So regardless of what you see in the error and the download site you go to, you need another version. There are a few articles online about this error, but none were correct for the scenario i found a clients network in. Not that I think the specifics matter, but this was Exchange Server 2016, Windows Domain Controllers running 2012 R2 and Exchange Hybrid. All the mailboxes had already moved to the cloud and the Exchange Server is used for attribute management and SMTP relay. Sometimes, randomly it would seem, the applications fail to send email and get back the above error. So what does it mean! Lets dive into the Exchange logs to find out more. The protocol logs contain a number of columns to the left. The interesting ones for this are the connector name (“SERVER\From Internal Servers (Relay)”), the session ID (08D68772EDC476C6) and the sequence number (each item on the protocol has a incrementing sequence number, in the above it goes from 0 where the session connects (which is the + at the end) to 18, where it disconnects (the – at the end of the last line). So we see that it is DNS. Online there are articles about this being to do with IPv6, AAAA records and invalid responses to those queries and fixes include using external DNS settings or smarthost values. None of this worked in this example. Internalproxy is what Exchange users to send email from the frontend transport service to the hub transport service. But which hub transport service are we going to use? If does not matter if you have 1 or x number of Exchange Servers in your site, it will use DNS to look up the IP of one of these servers. So even if you have a single Exchange box, DNS is vital. In the above log we see that DNS 10.10.10.21 returns InfoNoRecords when queried for the Exchange Servers own name. So I resort to nslookup to check DNS from this Exchange server. I have two DNS server, .20 and .21. The error appears to be related to .21 in this case. To I enter “nslookup server.internal.co.uk 10.10.10.21” which means look up the name of the server using the DNS server 10.10.10.21. I got back a message saying cannot find server.internal.co.uk: Query refused. When I tried the other DNS server I got back a successful response and the IP address of the server. So for immediate fix, I removed 10.10.10.21 as an option for DNS for this server. Exchange immediately went back to work and PRX2 errors where not displayed and email got to its destination. Now to go and see who has broken DNS! And there is nothing useful on the web for this error, so I wrote this to help you get out of this hole! Run the correct cmdlet and migrations will start! An excellent resource for Microsoft Exchange Server and Exchange Online administrators and consultants is the Remote Test Connectivity website at http://exrca.com or https://testconnectivity.microsoft.com/. I came across this error with a client today and did not find it documented anywhere – so here it is! This is caused because you have a user or other object in Active Directory that has the same name as the mail enabled public folder object. 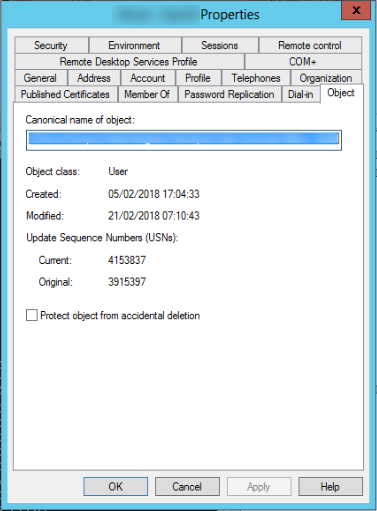 In Exchange Online PowerShell if you run Get-User PublicFolderName you should not get anything back, as its a Public Folder and not a user, but where you see the above error you do get a response to Get-User (or maybe Get-Contact or any other object that is not a Public Folder. This class of object name (common name or cn) means the script can create the public folder in the cloud, but not update it on subsequent runs of the script. 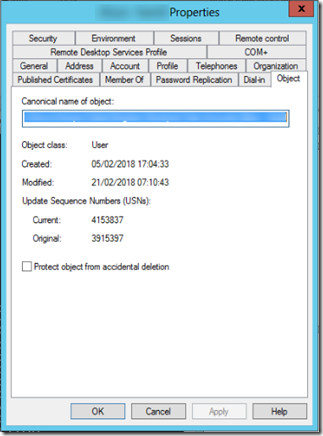 The easiest fix is to rename the common name of the public folder object in Active Directory for all clashing public folders, unless you know you do not need the other object that clashes – as renaming that and letting AADConnect sync process the change is another way to resolve this. I have changed my names to start with pf, so PublicFolderName becomes pfPublicFolderName and then the script runs without issue. Did not find a lot on the internet on this particular error, so I guess it does not happen very often, but in my case it delayed to move of the mailbox in question by a week or so until I could resolve it. When a mailbox is moving to a different Exchange organization (cross-forest or to/from Exchange Online) the move process copies the mailbox data to the target database and then right at the end of the move updates Active Directory in both the source and target forest. In the source it changes the object type from mailbox to mailuser (or remotemailbox if Exchange Online is in play, though this is really a special form of mailuser) and in the target, updates the mailuser to become a mailbox. This particular error occurs at this stage. The Get-MoveRequest cmdlet reports Failed as the status, and Get-MoveRequestStatistics reports FailedOther as the status. If you get the move logs (Get-MoveRequestStatistics <name> -IncludeReport | FL | Out-File <filename.txt>) then in the logs you will see CannotEnterFinalizationTransientException as the error repeated many times until the move fails. 1. Check that the Exchange System account has permission to the Active Directory object in question. In Active Directory Users and Computers choose View > Advanced to enable the Security tab and then view the security tab on the object in question. Edit > Advanced and then check or click “Enable Inheritance” option or button (depending upon version of AD tools). If inheritance is already set to enabled there is probably no harm in disabling inheritance, copying permissions and then enabling inheritance again. 2. Move the mailbox to a different database in the source Exchange Organization (New-MoveRequest <name>) and waiting for that to complete. 3. Removing and restarting the move in the target forest. If you do not remove and restart the move in the target you will see both MailboxIsNotInExpectedMDBPermanentException and SourceMailboxAlreadyBeingMovedTransientException. The first of these is because the mailbox is not where the target move expects it to be, and the second of these is becuase the source is currently being moved and so cannot be moved to the correct target forest at the same time. This should resolve your ultimate move request – it did for me! The object <name> has been corrupted, and it’s in an inconsistent state. The following validation errors happened: The access control entry defines the ObjectType ‘9b026da6-0d3c-465c-8bee-5199d7165cba’ that can’t be resolved..
You do not see this error on any mailboxes that you have moved to Office 365 in hybrid mode, that is you do not see it on any RemoteMailbox objects. 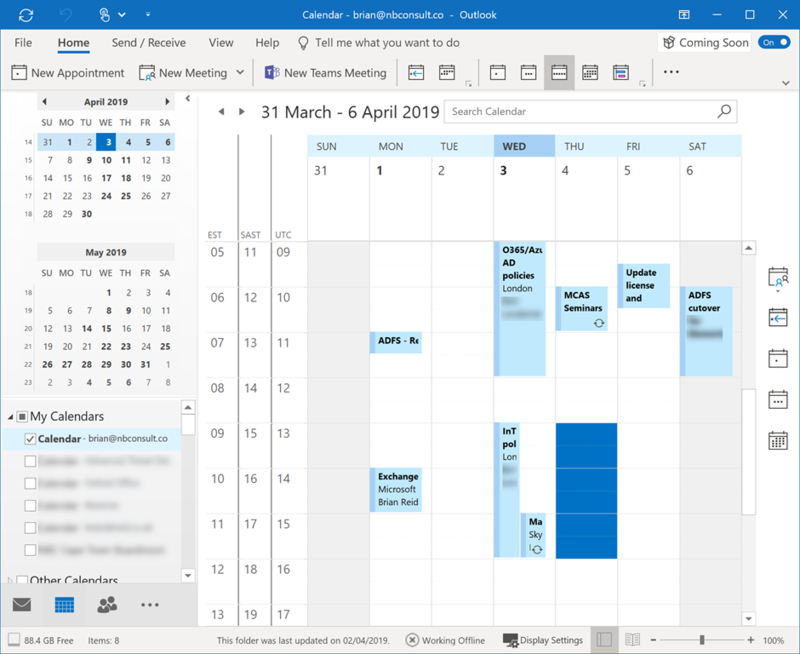 The issue is because ObjectType ‘9b026da6-0d3c-465c-8bee-5199d7165cba’ is the GUID of the DS-Validated-Write-Computer Control Access Right introduced in WS2016 AD DS which is new to your Active Directory upon installing your first 2016 domain controller. 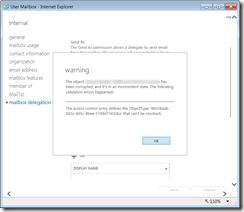 Exchange Server reads this access control list when you open the Mailbox Delegation tab in Exchange Control Panel or when you run Get-ADPermission on the mailbox. This error is cosmetic, but to remove it you just need to reboot all your Exchange Servers in turn (relying on your database availability groups and load balancers to maintain service). Once you have rebooted each server, the error goes away when you are connected to that server for administrative functions. There is no impact on user connectivity whilst this error is in place, though it may impact you ability to assign permissions without error. Therefore recommend that you reboot one server as soon as you can and then use that server as your target for administration until you can reboot the remaining servers. Automap for shared mailboxes does not work across forests when moving mailboxes. That is, is UserMailbox is granted full access to SharedMailbox you will see the following in Active Directory (Advanced View) > Attribute Editor > msExchDelegateListLink = “CN=UserMailbox,OU=etc” (on the SharedMailbox). And for the UserMailbox in Active Directory (Advanced View) > Attribute Editor > msExchDelegateListBL = “CN=SharedMailbox,OU=etc”. When you migrate mailboxes across forests you make use of Prepare-MoveRequest.ps1 to copy all the attributes. The msExchDelegateListLink is not part of this attribute set and the msExchDelegateListBL is auto populated so we can ignore it for now – if msExchDelegateListLink was copied and updated to the new forest name, then msExchDelegateListBL would be filled in automatically. So how do we copy the msExchDelegateListLink value for each user and then write it to the mail user object in the target forest before the mailbox is migrated (or if you have already done your migration and found this property missing and so automapping of shared mailboxes having failed (though the permissions have been copied fine), how can you grab the data from the old source forest and apply it to the mailboxes in the target? Using PowerShell and the ActiveDirectory module is how. First you need to export a list of all the automapped shared mailboxes each user has (this is the msExchDelegateListBL values for the user mailboxes you have migrated). There are two cmdlets to run here, the first does the entire source directory and the second filters the output to an OU and its child OU’s (so you can export a subset of data) using SearchBase. Only one of these two cmdlets is needed. This code is PowerShell and needs to be run from any domain joined computer. These cmdlets return a CSV file listing each mailbox that has an automapping to a shared mailbox and what that shared mailbox is. The CSV file then needs copying to the target AD forest, and as the target forest is very unlikely to contain the same OU structure and domain names, the DN of each object in the CSV file needs updating. This can be done with Find/Replace in Excel or Notepad quite easily. In this I have the DN of the mailbox and the DN of the shared mailbox in the source forest. 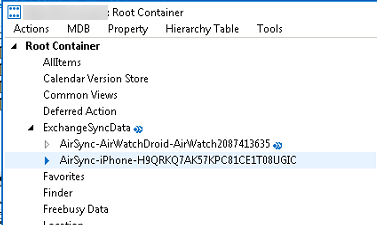 Use Find and Replace to change all the source DN’s (or the OU/DC bits) to suit the location of the matching object in the target forest. For example, my above “second user” was as shown, but after updating the DN might be “CN=Second User,OU=Migrated,DC=target,DC=forest”. So in that case I find/replace “CN=Users,DC=domain,DC=local” for “OU=Migrated,DC=target,DC=forest”. Now that I have a row in the CSV for each Shared Mailbox to User Mailbox mapping, I can set the msExchDelegateListLink value on each shared mailbox for the DN of the user that has access to it. This will update the msExchDelegateListBL on the user object automatically. In terms of errors in the above, if you get “get-aduser : Directory object not found” then the DN value for the Shared Mailbox is wrong, and if you see “set-aduser : The name reference is invalid” then the DN value for the user who has access to the shared mailbox is wrong (the DistinguishedName column in the CSV). The script can be run multiple times, so you are safe to fix the CSV file and import the entire list again. It will only add a given DN once in total per shared mailbox. If your target (or source) forest has more than one domain, run the script from a server in the correct domain or use “-Server DC-name” in both the Get-ADUser and the Set-ADUser cmdlets. This document is up to date as of November 2018 and is therefore unlike many earlier documents on this issue as this feature set is in the process of changing. First, Send-On-Behalf is changing so that it is supported across a hybrid Exchange Server to Exchange Online connection. At the time of writing this is in the process of being rolled out, so it might well be in your tenant by the time you read this. But even if the config for this is enabled in the cloud, there is config that is needed on-premises. 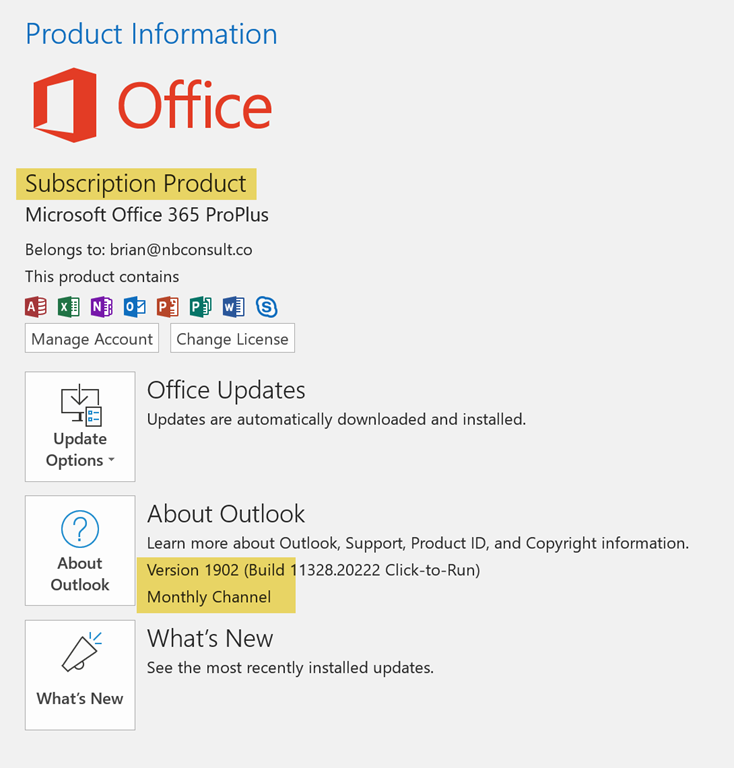 In Exchange Server 2013 you need to be on the latest CU and then run Set-OrganizationConfig -ACLableSyncedObjectEnabled $True (as mentioned in https://docs.microsoft.com/en-gb/exchange/hybrid-deployment/set-up-delegated-mailbox-permissions). 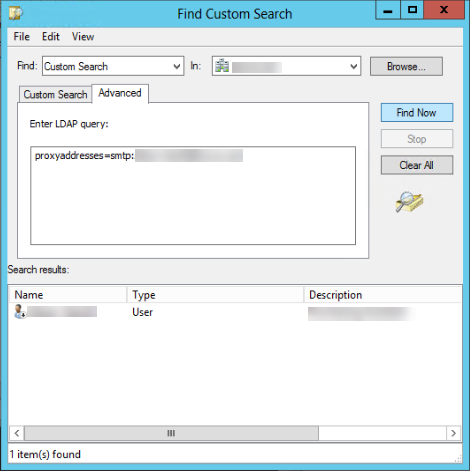 For Exchange 2010, this is not an option (and the ACL sync needs to be done manually) and for Exchange 2016 it is documented that this cmdlet is already enabled. But this is not true; Exchange Server 2016 needs treating in the same way as Exchange Server 2013 regardless of what the Microsoft article says at the time of writing. 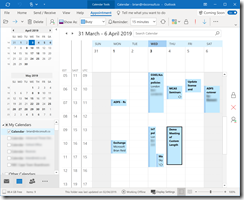 So what does -ACLableSyncedObjectEnabled $True do – well it changes Exchange Server so that all MoveRequests completed after the change leave behind a RemoteMailbox object where msExchRecipientDisplayType is -1073741818. For reference before the change to the OrganizationConfig this value on a RemoteMailbox was -2147483642. An ACLableSyncedMailboxUser is one that can have Send-On-Behalf permissions set or maintained across on-premise and the cloud – that is once your tenant is updated as well. This though leaves a few issues – the main one is that the RemoteMailbox left behind by the MoveRequest is only set to -1073741818 where the RemoteMailbox is made by a MoveRequest. 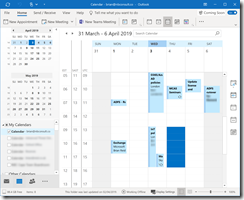 If once you have moved all your users you start provisioning users directly in the cloud, then New-RemoteMailbox or Enable-RemoteMailbox will not set msExchRecipientDisplayType to -1073741818. This cmdlet would need to be added to your provisioning scripts, and if you don’t have scripts to provision users in AD and have a mailbox in the cloud, then now is the time to look at this as the number of moving parts is growing. 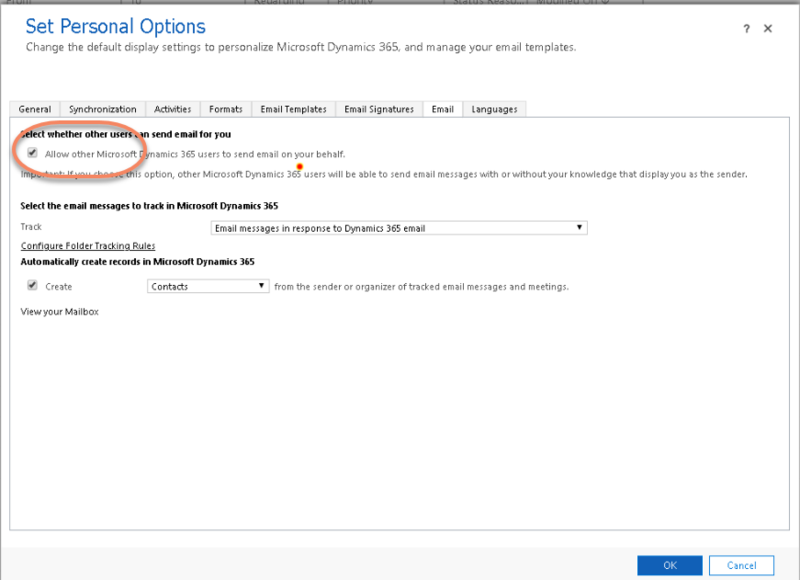 If you do not do the msExchRecipientDisplayType change then some of your remote mailboxes in Exchange Online will be able to be granted permissions for Send-On-Behalf and other permissions as they are added to the cloud, as they are ACLable (as in we can set them in Access Control Lists, ACLable! ), and others users will not be. 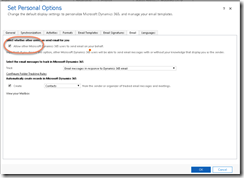 To make these changes you need to change the msExchRecipientDisplayType on-premises to -1073741818 and wait for this to sync to Azure AD and then wait for that to sync from Azure AD in the Forward Sync process to your Exchange Online directory. 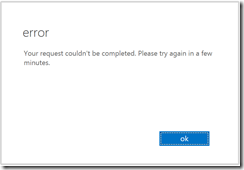 This error can turn up in Exchange Server when Exchange Server is trying to resolve the object that it should deliver a message to. 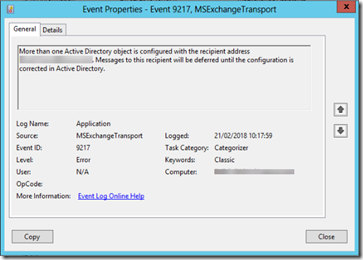 Exchange queries Active Directory and expect that if the object exists in the directory, that the object exists only once. 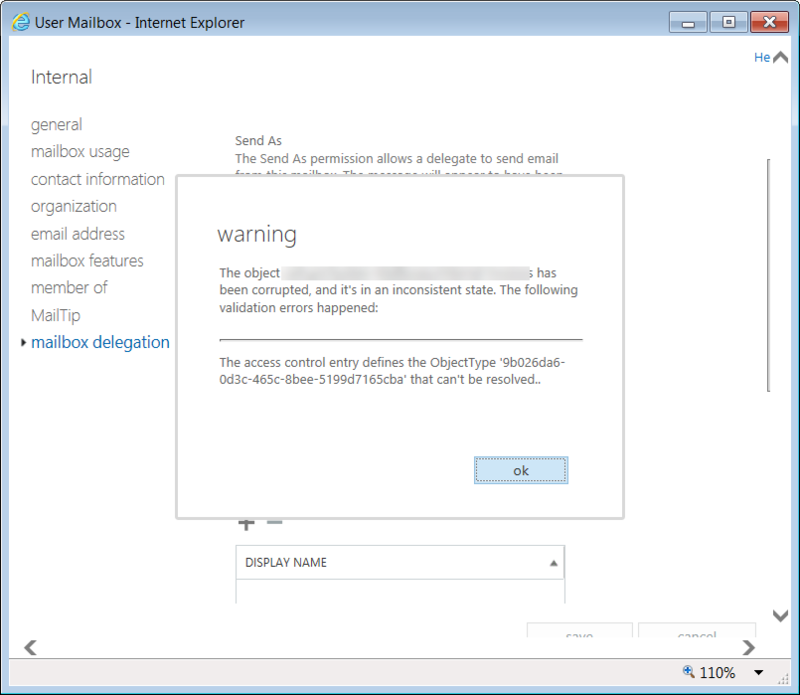 If the object exists more than once, this is the error – as Exchange does not know who to deliver the email to. The error is visible when running Get-Queue in Exchange Management Shell, and seeing that there are lots of emails in the Submission Queue. If you run Get-Message –Queue servername\Submission | FT Identity,FromAddress you can pick one to look at, and for that one run Get-Message server\submission\ID | FL where server\submission\ID is the Identity value from Get-Message cmdlet. Here you will see LastError and Recipients showing the ambiguous address error. There are a number of articles on the internet covering this issue, but I came across a unique one today. The easy way to search for the issue is to find the address that is in duplicate. 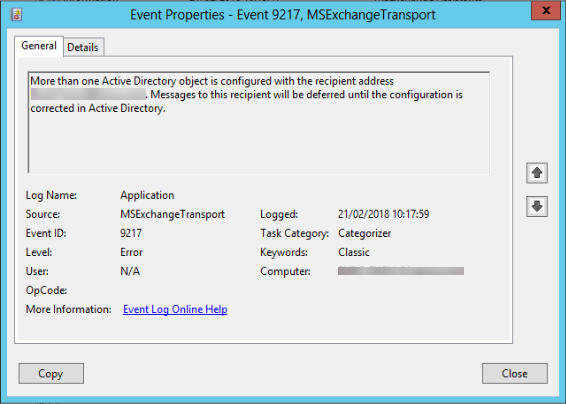 This will be listed in Event Viewer under MSExchangeTransport as the source and Event ID 9217. The Task Category will be Categorizer, as the job of working out who is going to get the message is the role of the Categorizer. An example of this error is shown. So the fix. Often suggested is to do a custom AD query for “proxyaddress=smtp:name@domain.com” where name@domain.com is the email address shown in the event log error. If this returns two or more recipients, and this will be across all the domains in the forest, then you need to decide which is the primary one and carefully delete the rest. By carefully I mean that you want to leave either one contact, or one mail user or one mailbox etc. If the duplicate is two contacts, then find the one with the most correct information on it and carefully delete the other. If you find two mailboxes, work out which the user is actually logging into and has email in it – and carefully delete the other etc. And by carefully, here I also mean that on the object you are going to delete, copy the legacyExchangeDN value and then delete the object. 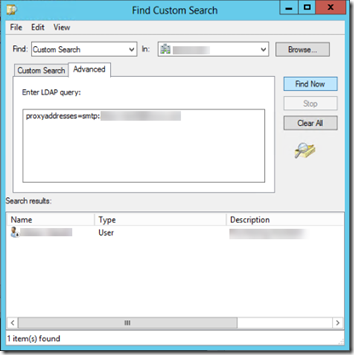 Then find the real correct object and add a new x500 email address to the proxyAddresses attribute of the correct user. The value of the x500 address will be the legacyExchangeDN that you copied from the deleted contact. This will ensure that users who have previously emailed the now deleted contact before, will still be able to email the remaining object. But what is unique about that? At the customer I am working on at the moment the issue was that doing the proxyaddresses=smtp:name@domain.com search only returned one object across the entire forest – what is duplicate about that? Well in my case, the user had user@domain.com added to their proxyaddresses twice – they were the duplicate object to themselves. Note that the name@domain.com value, the one in error in the logs, appears twice but not starting SMTP (primary address) or smtp (secondary address) but without an address protocol at all! And also then opening the user in Exchange Management Console showed that the address without the smtp: value was shown with it. Remove one of the two addresses and within ten minutes the emails queued to this user in the submission queue will be delivered. Restarting the transport service will also kick start the submission queue as you cannot use Retry-Queue against this queue.